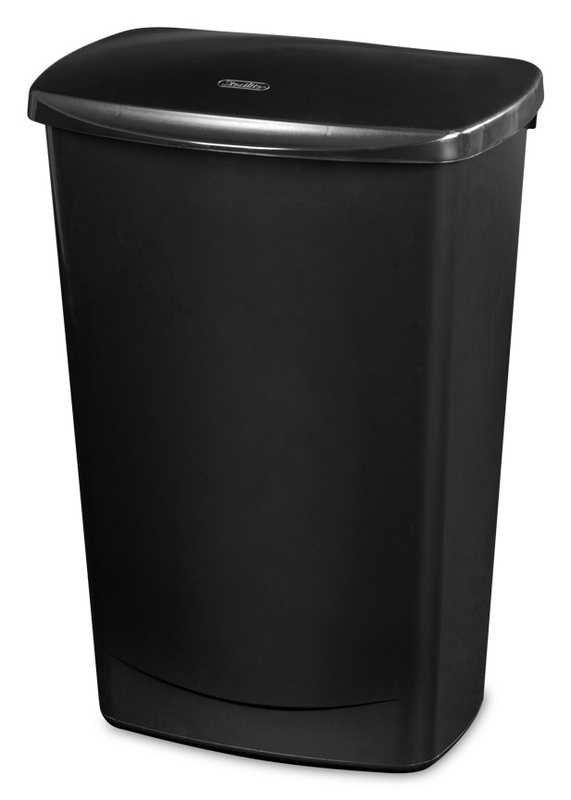 The 11.4 Gallon Lift-Top Wastebasket integrates functionality with a simple, elegant appearance. It offers an easy-to-lift lid and a contemporary, polished finish. It is designed with hidden hinges on the backside of the unit so a trash liner can be put in place without removing the lid or interfering with the hinges. The unique design of the lid makes opening the wastebasket easy, and the lid will stay open for disposal of oversized items. The slim profile is ideal for use in the kitchen and is perfect for tight spaces, yet offers a generous 11.4 gallon capacity. 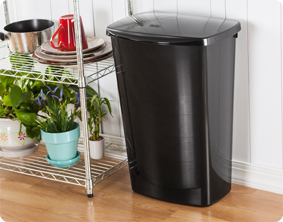 This wastebasket accommodates a standard 13-gallon trash liner and offers an easy-to-clean surface. The overall dimensions of this item are 16 1/4" L x 12 7/8" W x 24" H.
Overall Assembled Size: 16 1/4" x 12 7/8" x 24"
This wastebasket space saving design makes it ideal for fitting against a wall or cabinet in the kitchen. 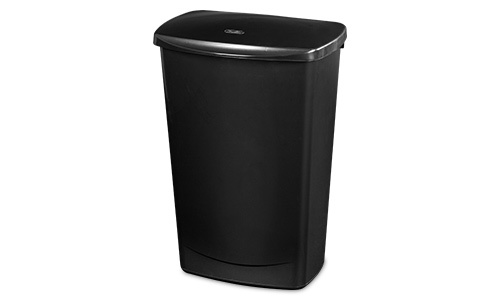 11.4 Gallon LiftTop Wastebasket is rated 4.0 out of 5 by 4. Rated 1 out of 5 by unhappy purchaser from top poorly designed bought a step on 11 gallon can , the base is sturdy but the top has broken in about three months . I could not recommend this product to any one else because of the poor quality. Rated 5 out of 5 by mommi2acg from First one lasted 7 years - buying another! Excellent quality! Bought one of these trashcans in June 2007 as our main kitchen can. It has JUST now broken (the push top lid will no longer stay shut). I am amazed that with 4 young kids all these years it has not broke before now. I absolutely love this design with the flat back because it is kept in the open at the end of our counter. I love the removable lid that I can easily wash. It holds a 13 gallon bag perfectly and is very roomy. I don't want to pay a lot for a 'fancy" can that I can't remove and wash the lid, and is too heavy to take outside to hose out when it gets dirty. I am going out today to buy another one of these because of the quality and durability at a great price! Only wish it came in black also, so as not to show as much dirt. Rated 5 out of 5 by CG from It works! So the last thing you want is a garbage can that doesn't work. All it needs to do is simply hold a bag with garbage and keep the smell down - this does exactly that! No gimmicks, no fancy levers ( that just get really dirty ), no frills, but most importantly it works. I've had several other garbage receptacles (some not cans) and I still like this the best.